There are great amount of subjects which have a chosen set of fetish and dark delirium. The grasp of such discussions is always a bit without air. Silent whispers are the only ally when it comes to discussing the dreaded and the obnoxious. 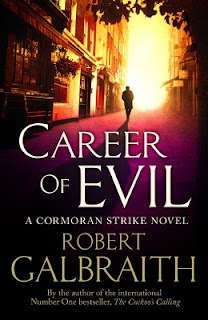 Robert Galbraith in her third venture "Career of Evil" has tried her hands on exploring the dark alleys hidden in plain view and what's there and more to be seen is a paradoxical twisted discovery. So how successful Galbraith is putting the two and two together? Let's find out. When a mysterious package is delivered to Robin Ellacott, she is horrified to discover that it contains a woman's severed leg. Her boss, private detective Cormoran Strike, is less surprised but no less alarmed. There are four people from his past who he thinks could be responsible - and Strike knows that any one of them is capable of sustained and unspeakable brutality. With the police focusing on the one suspect Strike is increasingly sure is not the perpetrator, he and Robin take matters into their own hands and delve into the dark and twisted worlds of the other three men. But as more horrendous acts occur, time is running out for the two of them... A fiendishly clever mystery with unexpected twists around every corner, Career of Evil is also a gripping story of a man and a woman at a crossroads in their personal and professional lives. You will not be able to put this book down. You can hate and love Harry Potter but you cannot Robert Galbraith. The alter ego has undergone a sea of changes since its inception. From Cuckoo's calling to Career of Evil there have been giant leaps towards a much darker intonation and Galbraith seems to be mastering the art with every new piece of fiction. The blurb is pitch dark gory and not a very pleasant sight for the readers. But it has to be explored and it is there to be discovered. A discovery to a new world. Cover, title and the blurb are a combination of gothic thinking and rough deliverance. The story is set off in Cormoran Strike's office where his secretary discovers a piece of leg in a cargo. Alarm bells are set ringing immediately as Cormoran suspects somebody from his past to be the doer of it. But the task ain't easy. With a missing body, a messed up past, a scared yet defiant secretary Cormoran has to run lengths and breadths to discover this one. Will the beginner's luck abandon him? How will the lives of both Robin and Cormoran be entwined in this doldrum? Is there a way out from where they seek and look? Is past just a myth or present just a farce? Let Cormoran and Robin be at it's neck to solve the mystery behind the leg. First things first. It is a gory fetish which will allure the readers to go through the book. It is the not so charming personality of Cormoran that will lead you to believe in the book. It his learned secretary Robin who will set the pace of the book and it is who shall not be named that will change the course and complexion of the story. It is so dark even darkness will have a new synonym. Kudos to the author to think out of the box for the subject. It is a narrative with a lot of hiccups but the hiccups are well placed and well controlled to let the book be within limits and not become an exaggeration. There are very methodical and surgical traces in the story which sets it apart from the conventions of a thriller. It acts on its own and reacts violently when the core is shook, But the growth of the story is very demented and demands some serious concentration. Power lies in the words weaved to make it a story. There is a deceptive charm to the antagonist and a clumsy Cormoran complements the suit perfectly. The book has a severe problem. It ain't sharp when it comes to juggling between past and present; professional and personal. There is a conflict of emotions on both the fronts which overpowers the characters and lets the steam off. The predictability factor is a touch too high as the book loses the zip and momentum by its second half. There are long narratives which don't make sense at all with context to the story. The limited use of area of action is another setback to the story. Overall, the book is a decent balance but fails to live up to the hype. It has a rigid core but mushy outer half. Penetration with the story is there but letting a lot off the hook is a turn off. The book screams a lot of emotions and sentiments which is its strong suit and leaves a lot to wonder about the subject it covers. The highs and lows keep swinging into each others territories and knocking out few crucial elements out of the way. The wonder and despair is there but the outcome not withering. It had a lot to claim but just left a gap wide enough to let the anomalies seek in and weather off a brilliant story.